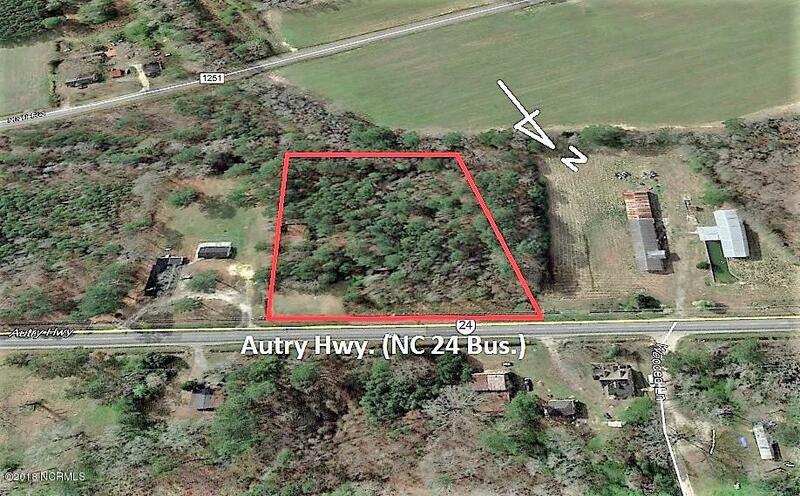 2.726+-Acre (excluding road R/W) wooded site with 298+-feet fronting Autry Hwy. (NC Hwy. 24) and improved with an abandoned shelter, concrete pads, hopper and SWMH overgrown with natural growth trees. Former S&W Ready Mix Concrete site. Located within the ETJ of Roseboro about 1,000' west of Roseboro town limits at Lucas Road. Prior use was as a ready mix concrete facility that was abandoned years ago. The covered shelter may be of use to buyers. There was no zoning at the time this facility was erected but it is now zoned Residential/Agricultural which doesn't permit a concrete facility. Improvements may have some salvage value to a buyer. Unrecorded survey map is an Exhibit. Listing provided courtesy of Frank F Butler of Butler & Faircloth, Realtors.